Château les Carrasses is a 19th Century wine Château, which has been extensively restored as a luxury hotel and boutique winery. Perfect for a weekend break or longer holiday, every suite, apartment and villa at Château les Carrasses is spacious and luxurious, making the most of the superb volumes and textures of the 19th century buildings. The Château is located in the village of Quarante, in the heart of the Languedoc wine region. Its remote location means that it is most suited to those with access to their own vehicle and the driving time is 40 minutes from Béziers or an hour from Montpellier airport. Here, you will be truly immersed in the region’s stunning countryside and the rural location offers a peaceful stay. Facilities include a magnificent infinity pool, a floodlit clay tennis court, a boulodrome and a barbecue area as well as a conservatory, orchard and an olive grove. The brasserie and bar serve elegant Mediterranean cuisine alongside the best regional wines and classic cocktails – to be enjoyed around the pool, in the salon, the tasting rooms, or on any one of several terraces. 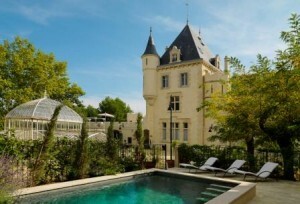 The Château’s luxury accommodation consists of 28 suites, apartments and villas. Furnished in elegant French style, the properties suit parties up to eight people. Each property is individually interior designed, though all share a chic French take on tradition-meets-modernity. Beds are large and comfortable and bathrooms have large tubs and/or showers, comfortable bathrobes and Fragonard toiletries. Living areas offer WIFI, flat screen TV/DVDs, and fully-charged iPods with carefully -selected playlists. 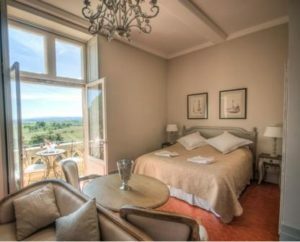 Grape Escapes guests will be staying in the original bedrooms of the Château, converted into open-plan suites with defined sleeping and relaxing areas and a terrace or balcony with beautiful views.